In the bloody war that ended between Th Congress Worlds and the alien ahtra, Captain Eli Dammond had distinguished himself as an officer who could no wrong--until his last catastrophic battle. Now, with his shining reputation tarnished, the commander finds himself assigned to a grimy kettle of a ship making basic transport missions. Routine work -until he arrives on Null: a barren, scorned world at the mercy of two suns. Here, a marooned human outpost has survived for three years until their rescue by Eli's ship. But on this austere planet, the human newcomers are about to learn a harsh lesson: that nothing is quite as it seems. For soon a new season will call forth a hidden ecology both exquisite and deadly. And Null will test the survivors in a fight no soldier was ever trained for, and few can predict - while a young the survivors in a fight no soldier was trained for, and few predict - while a young woman of privilege may well prove to be their finest warrior. Yet for Eli Dammond, the worst struggle will unfold below the surface. There he will discover a threat to all the settle human worlds, even as he matches wits an adversary both familiar and alien. The odds are against human survival on null's surface or indeed, in the galaxy-- unless Eli succeeds in bringing home the hard-won secret that neither human nor ahtra can hear. Kenyon's vision of a unique universe ranks with those of such science-fiction greats as Frank Herbert and Orson Scott Card. Kenyon should prepare herself: readers will anxiously anticipate a sequel. "A rich weaving of science, politics, and mysticism. A believable memorable story." 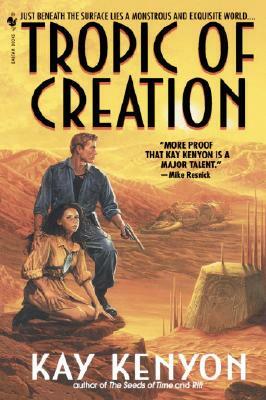 "More that Kay Kenyon is a major talent."